When introducing App-V concepts to people who are new to the product one some of the more interesting conversations arise as soon as the word streaming is mentioned. Streaming means many things to different people, everyone tends to have pre-conceptions about what it entails and often the term is misused. The word streaming can also raise concerns about bandwidth and performance. In reality with App-V there will be certain decision points from packaging to deployment to the client that will dictate the default behaviour regarding how packages will get streamed into your Package Store (cache). The decision made here will dictate what happens in the scenario when a package is published to a user/machine, it is not fully cached and the package is then launched. At this point its important to remember that this is only IF a package is not available locally in cache at time of launch and there are plenty of other opportunities outside the sequencing process to make sure this is not the case. You can read more about these options here however all you probably need to know is unless you have a specific requirement the Microsoft best practice and recommendation is to fault stream. This also happens to be the easiest to set as you just have to click next and shrug off the warning prompt. 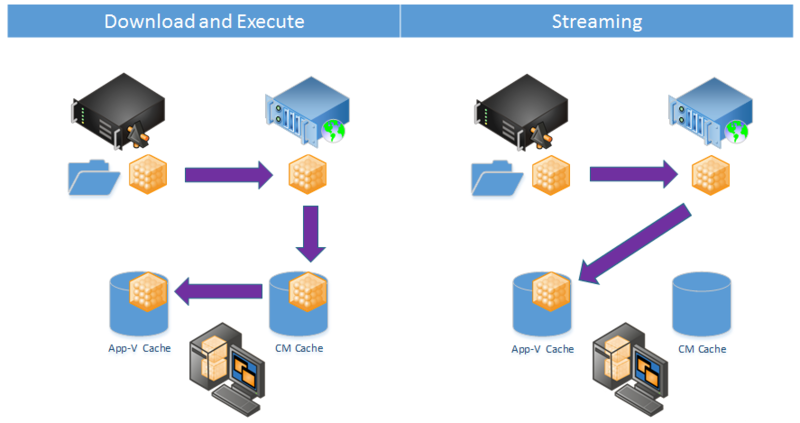 Fault streaming will mean in the event that your package isn’t fully in cache, the bare minimum your application needs as and when its requested will be streamed down locally. If you use the PowerShell Sequencer then the default will be fault stream unless you explicitly use the -FullLoad argument which will set it as fully download, there is no option or opportunity to use feature block definition unless you save, reopen the package in the GUI and run an update to reconfigure and resave. As far server side delivery goes there is only one delivery based option to decide and that is only in SCCM 2012 onwards. This relates to whether you would like a download and execute or streaming delivery. If you chose the default download and execute just remember the mount operation on delivery will take place meaning some of the other streaming decision points mentioned here become irrelevant. A streaming delivery will only complete an add and publish operation but will however require connection a distribution point with the content on first launch. The App-V Full Infrastructure doesn’t give you any streaming decisions, it will do a add and publish and let your other decision points come into play. So this is less a consideration for SCCM deployments where you will more than likely be using distribution points and the built in mechanisms for content distribution. Otherwise you will need to decide how you wish to house your content for retrieval by clients and also how you wish to distribute it. The content store is a file or web server location for .appv content and related files. From a client perspective files should be accessible via either SMB or HTTP(S). For most scenarios the default will probably suffice however there might be instances where you rather all published apps come into App-V cache regardless of whether they have been used (option 2), for example I have seen some places where they take this approach for laptop users who may not be on the network for long but would expect to run packages locally offline. Read more about this setting here. Please note however this setting will be overwritten in SCCM deliveries due to the LocationProvider unless you take the steps mentioned here. 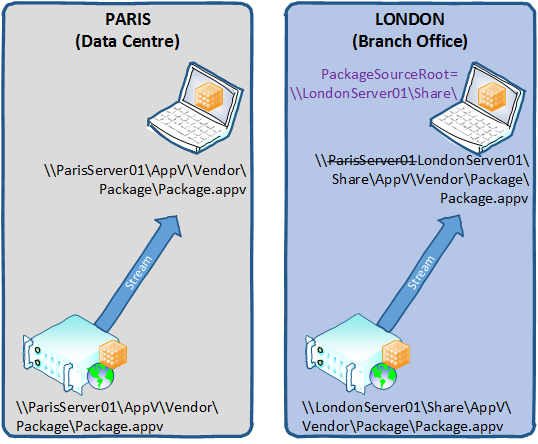 You can set this via PowerShell (Set-AppvClientConfiguration -PackageSourceRoot [path]), group policy or client installation time /PACKAGESOURCEROOT=\\LondonServer01\Share\. I have seen this set via group policies linked to AD Sites to manage roaming users and to ensure they always pick up a local streaming source depending on which office they travel to. Falko has a great blog about configuring PackageSourceRoot here, by the way he’s the same guy that has made the App-V Visio stencils I use in most of my graphics! Probably one of the headline features that came with App-V 5, shared content store (SCS) mode gives us the ability to never cache anything locally above and beyond feature block 0. By enabling this setting you can negate packages streaming into local cache upon launch however remember that some of the previous decision points might override this behaviour. For example if you are using download and execute delivery with SCCM, this will automatically mount the package locally, overriding the SCS setting for the given package. Find further information on shared content store mode here. While most of the settings relate to how things will stream to cache, this setting governs where that cache actually resides. By default your cache will reside in %ProgramData%\App-V and to be honest it makes sense to leave this as default unless you have a very specific requirement to have this elsewhere. The only real restriction on where this can be configured to reside is that it should be a global location locally on the machine. This simple setting allows App-V to take advantage of any current Branch Cache implementation in your environment. It is off by default to allow for multi-range HTTP but if you want to enable this feature you can set it via PowerShell (Set-AppvClientConfiguration -SupportBranchCache [0|1]). For a full explanation check out my friend Steve’s post here. 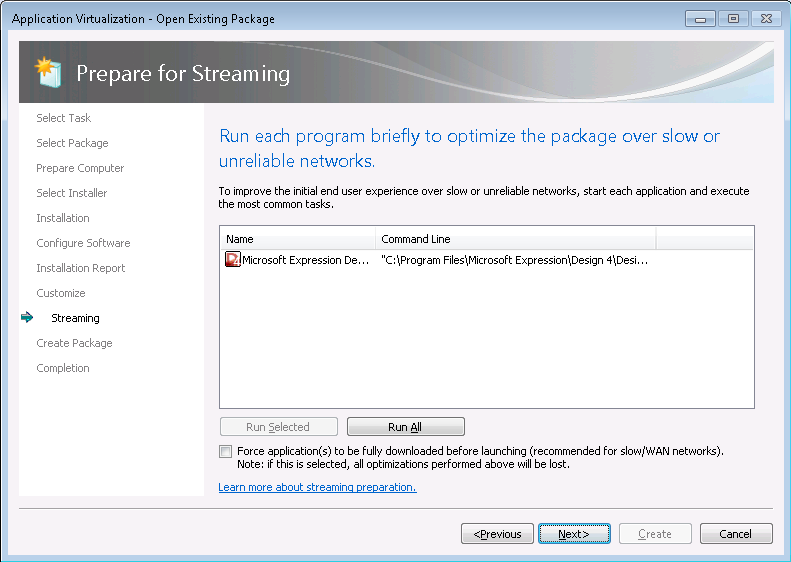 This setting dictates whether or not your clients will attempt to stream when on a metered connection (for example 3G/4G) on platforms from Windows 8 and newer. This is set to disabled (0) as default as you would expect however can be enabled via PowerShell (Set-AppvClientConfiguration -AllowHighCostLaunch [0|1]) or via group policy. Well explained Thamim. I will definitely recommend this article to all App-V techies. Hi Tham, my client use Thinapp and VSphere as well it’s useful as no client side pre deployment is required. I’d like to leverage App-V in the same manner. 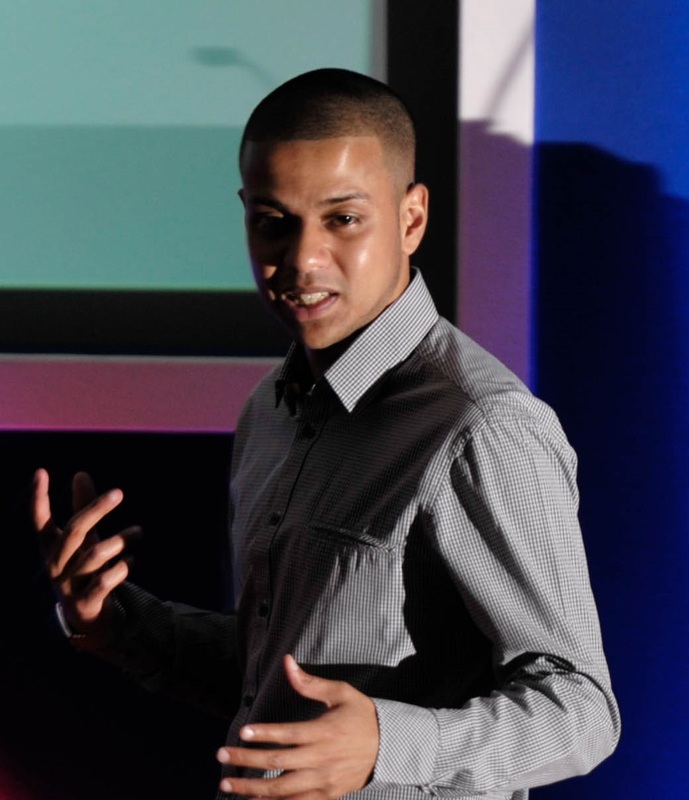 Do you have any notes on publishing via RemoteApp. 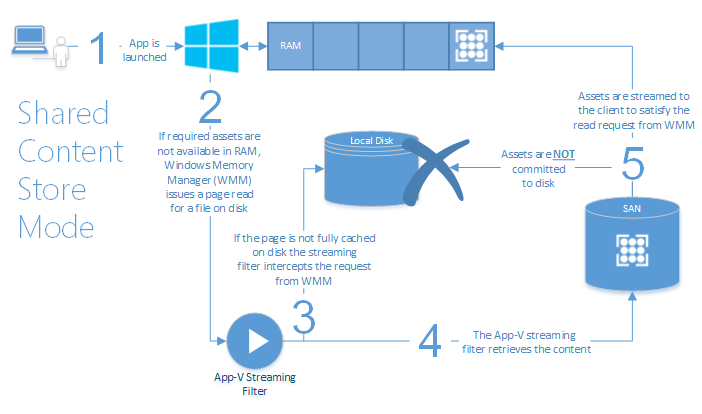 Regarding RemoteApp, its really a case of just delivering App-V packages to a RDS machine and utilising the standard techniques to deliver access to the package via RemoteApp, that part is exactly the same as publishing a local application to an end point. I’ll post a step by step when I get a chance! Note: Using Mount-AppvClientPackage in combination with Shared Content Store needs “Run as Administrator” to work but would cache the application on local disk. Hope you doing okay mate, be great to catch up sometime! Thanks Thamim, does that just mean it’s a case of installing the BranchCache role on the publishing servers then? Depends on your BranchCache design. You need to enable it on your content server (if that happens to also be your publishing server then go ahead). Then depending on whether you are using distributed cache mode or hosted cache mode you should enable the Branch feature on the clients or server (if this happens to be a publishing server then go ahead). Then just enable the App-V BranchCache setting as detailed above. No problems! Hope everything is going well down in Devon and do give me a shout if you guys need anymore assistance in future, be great to see how you are getting on since I was last down. I’ve been testing deploying an App-v Office 2013 created through ODT and deployed through SCCM 2012. Deployed via “Download and Execute” 2gb downloaded to App-v cache under the versionid folder. When I then package the latest version via ODT I get another 2gb downloaded to the new versionid folder in the cache and so on. Deployed via “Streaming” 125mb initially in the cache after lauch streams as expected. but after upgrade I again get a doubling of disk space used. From what I’ve read only the bits that have changed should be downloaded but I’m assuming this behaviour only happens with an app-v server and not streaming from a DP. that’s what Microsoft support tell me. But it happens every time! Should this definitely be the case via SCCM too? Yes, because all it is doing is an add + publish from a DP instead of from a UNC path. What tool are you using to report back on disk usage? Hello Thamim, so far we never used Appv streaming in my current organization as we still migrating to SCCM 2012 (as you know SCCM 2007 doesn’t support Appv streaming). So can you please guide me or provide the links which can help me to build the understating on streaming. Thank you!! not using a tool just testing so it’s a visual check of disk space. Is the Download and execute behaviour as expected too? Download and execute will add-publish-mount. Again for updates of the same package ID only differentials will be streamed. Windows Explorer may just be reporting back on file sizes but you will see when you add the package, it immediately jumps to being predominately in cache.